Shelley (Hocknell) Zentner is a professional artist and faculty member at Lake Tahoe Community College Art Department. Born in Wales, Great Britain, Shelley came to the United States in 2005 on a bouldering road trip, fell in love and never left. She now lives with her husband and young daughter in Christmas Valley, where she paints in her riverside studio. Shelley’s paintings have been exhibited internationally since 1996 at venues that include The Museum Of Modern Art, Wales, The Bristol Guild of Art, and The Royal Cambrian Academy. During 2000-2005 Shelley established her own successful art gallery and open studio in her native Wales – supported and sponsored by the Prince’s Trust, The Arts Council of Wales, DMM International, The Royal Oak Hotel, and Arts & Business. Shelley had the honor of meeting art enthusiast Prince Charles in 2002. She has been a featured artist at several international mountain film Festivals in the UK, and her work toured with the prestigious Wales Drawing Bienalle. She held solo exhibitions of her work at Penrhyn Castle, The Albany Gallery, Ogilvy & Estill Contemporary Art Gallery in the UK. Recent mixed exhibitions include the Riverside Gallery in Truckee, Ca, “We the People” at The Tahoe Mountain Lab, and “Rising from the Fire” at High Vibe Artisan Collective in South Lake Tahoe, USA. 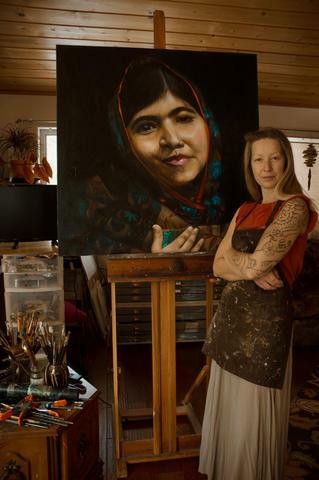 Shelley is the founding member of the local activist group, Tahoe Activist Artists, whose mission is to promote compassion, conversation and connection in our local community through art.